This station has been surrounded with much industrial interest in the past. In light of the complicated nature of explaining the track formation changes word for word - especially industrial - I have drawn a number of diagrams to aid the overall description. The South Eastern Railway's first North Kent Line between London Bridge and Strood opened via Lewisham, Blackheath and Woolwich on 30th July 1849. At the time of opening, Erith station was deep in rural territory, but the expansion of Victorian London thereafter would be rapid, changing the landscape into an industrial scene. At Erith, two staggered platforms served the 1849-opened double-track line, the ''down'' platform hosting the pleasing architecture of a symmetrical brick-built station building. This was one of a number of early stops which opened before the South Eastern Railway's ''cheap'' station policy began, the latter of which involved the provision of clapboard single-storey timber structures on all platforms. A pitched roof goods shed was located at the London end of the ''down'' platform, whilst the ''up'' platform was provided with a small timber waiting shelter, in addition to having a goods siding at its Dartford end. The station building is evidently the work of the SER's architect Samuel Beazley - it is worth comparing the styles of Erith and Gravesend stations, similarities most certainly being in evidence. Beazley was responsible for the design of most of the stations along the original North Kent Line. All stations along this route were opened with the customary short - at least by today's standards - brick platforms, reflecting the length of the the trains at the time, these of which generally consisted of four- and six-wheeled stock. In the early 1870s a signal cabin appeared adjacent to the ''up'' platform timber shelter, immediately behind the siding. This differed from its counterparts further east along the line by being a ground structure, lacking both a brick or wooden base. Nevertheless, a pitched roof, a brick chimney and SER-styled sash windows were features of this diminutive cabin. About twenty years later, however, it was augmented by the opening of a second cabin immediately adjacent to it, this virtually identical to the example still in existence at Snodland. There was also small expansion set for the general station layout and even larger growth for the rails outside the SER site. In 1898 a second set of sidings were opened at the Dartford end of the ''down'' platform, serving a cattle pen. By the turn of the century, industrial railway development at the London end of the station had rocketed: all standard gauge, a line now looped directly under the SE&CR site by means of a tunnel, linking two Gun Works and a railway wharf on the Thames. The gun works' lines joined the SER network via the existing freight sidings which served the single-track goods shed, on the ''down'' side. A 4 ft narrow gauge line belonging to Parish Loam's quarry pits also passed under the North Kent Line, about 320 yards beyond the platforms in the London direction. This narrow gauge line ran parallel under that same bridge with another spur off of the Standard Gauge line of the Nordenfelt Gun Works. Finally, on 26th August 1905, the double-track Erith Tramway opened from Abbey Wood and for this, gate crossings were put in place where it intercepted industrial rails. There is yet another industrial railway network in Erith which is, without doubt, worthy of a mention. ¾ mile along the line from the station in the Dartford direction was a private siding connection trailing off the ''down'' line. This stretched to what was known as ''Cray Coal Wharf'' (formerly ''Cory's'') on the Thames, and actually predates all of those previously mentioned industrial connections made within the immediate vicinity of the station. The branch originally opened in 1864 and connected the North Kent Line with the deepwater Erith Pier, the latter of which had originally opened in August 1842 for pleasure boat trips. With the closure of the pier in its existing capacity in 1874, and the sale of all the land associated with it, the Standard Gauge industrial network in this area boomed. By the turn of the century, this network of lines was now serving a coal terminal, an iron works, a brick works, clay pits and a gravel pit, plus an additional pier - Norris Wharf. The rails on Erith Pier - which was rebuilt using concrete in 1957 - were, however, narrow-gauge. This whole system went out of use in the late 1980s, when Erith Docks closed, thereafter laying derelict for a number of years. Planning permission was then granted in 1999 for a supermarket in the area, on the condition that the former railway pier was restored. This has been complete for a number of years now, complete with buffer stops! For the station itself, there were changes post-1900, these certainly for the better. On the ''up' platform, the SE&CR removed the small timber waiting shelter and replaced it with a far more substantial canopy, complete with an ornate valance and clapboard offices at the rear. A water column had since been provided at the Dartford end of the ''down'' platform, allowing locomotives to top up. Although the provision of this facility here is unusual, particularly in light of locomotive stabling facilities at Dartford (''Slades Green'' depot not opening until 1901). There has been much Southern Railway influence within the confines of the station, the most prominent being the riveted-steel footbridge, this having arrived in 1935. Next is the canopy of the main station building: the upward sloping design dates from the station's opening, but the valance is of SR origin. Lastly, the platforms have evidently been rebuilt by the SR in the Exmouth Junction-produced prefabricated concrete. Platforms were then lengthened during June 1954 to accept ten-vehicle EMU formations then being introduced. The extensions were fundamentally platform slabs rested upon concrete cast supports, typical of the Southern Region at the time and still in evidence at numerous stations on all divisions of the former SR network today. It was also during this period that the northern and eastern elevations of the station building received austere single-storey extensions, defacing the graceful lines of the 1849 structure. Following on 7th October 1968 was the closure of the domestic goods yard, but freight on the surrounding industrial lines continued to feature. Then, on 8th November 1970, the SER-designed signal cabin installed circa 1890, was closed, its functions being assumed by the Dartford Panel. The original ground structure from the 1870s remained in existence for over ten years after this. 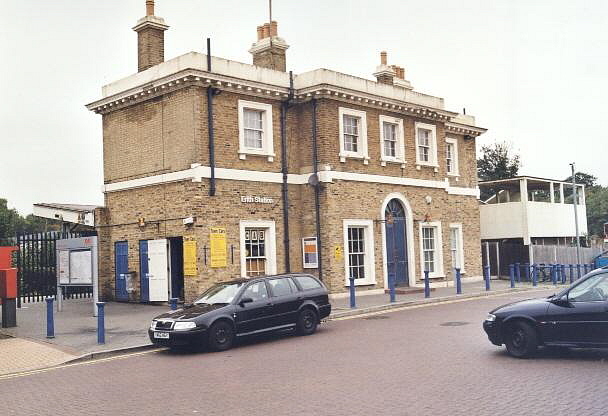 With the planning of a trunk road through Erith in the early 1990s, the station building was to be returned to its former glory. As part of the road project, the later single-storey extensions of the station building were demolished, the vintage brickwork restored, and the taxi forecourt was re-laid. The whole works, including the road (''Bronze Age Way'') were completed in May 1997.